Isaac Brynjegard-Bialik: Nice Jewish Artist: "Nevertheless, she persisted." I am daily disappointed, overjoyed, angered, uplifted, and I have dealt with the turmoil in the best way I can: by cutting paper. 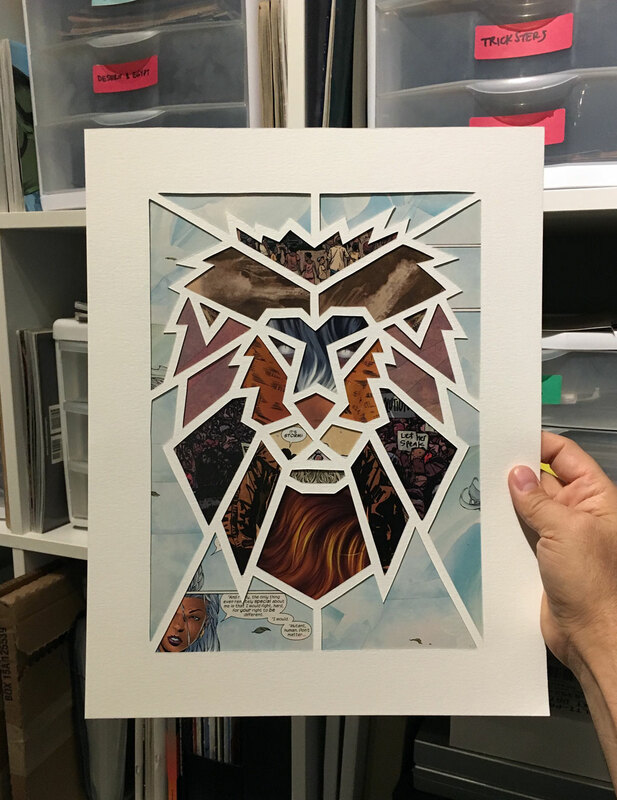 This is "Let Her Speak (Judah)" – a new papercut that's one of twelve in my "Twelve Tribes" series, and the whole series is (apparently) going to be protest art. Each of the twelve papercuts is made with a minority super hero, with bits and pieces that help me struggle along with the ups and downs in my daily news feed. "Judah" is traditionally represented by a lion, and is known as a leader — so my interpretation is made of cut-up comics featuring Storm (leader of the X-Men, occasional Queen, and so on). She's a strong woman who leads by example, and speaks truth to power. 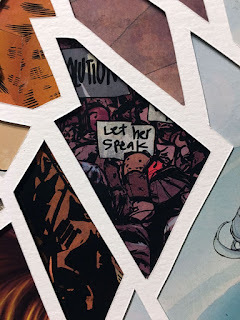 It's also got a few pieces of Brian Bendis's "Scarlet" as well (the protest scene shown in close-up below, for example). The whole series uses a lot more speech bubbles than I usually do – with messages reflecting my beliefs in what America stands for: welcoming the stranger, striving for equality and rights for everyone regardless of gender identity, color, religion, etc... an America in which we "Let her speak." I'll be premiering this series (and MORE) at Brave New World Comics (in Newhall, in the Santa Clarita Valley of Southern California) the evening of Saturday, April 8 — details will be posted here once I've got more to share, but please save the date for now. Why am I posting this early preview? I'm inspired by all of the #shepersisted activity that's sprung up after the efforts to silence Senator Elizabeth Warren. This piece isn't called "Neverthless, she persisted" (but I'm secretly working on such a piece for an upcoming group show... again, details to come).